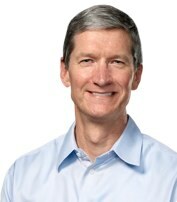 Apple on last 23rd held its annual meeting of shareholders. All members of the board (which is Tim Cook) were re-elected; Apple CEO received a score for his part Soviet, with 98% confidence votes. Shareholders have first obtained the members of this board are now elected only if they obtain a majority of votes. Otherwise, the person has to resign voluntarily. Tim Cook began by recalling that this was the first meeting since the death of Steve Jobs: "There is not a day that goes by that I missing," and thanking the shareholders have expressed their condolences, he added that this sadness in him had turned into determination. He promised to pass that Apple was still working as hard and this year it will launch products that would make sense ("some products That Will Blow Your Mind"). He ginned some numbers like 360 ​​Apple Store opened across the world, visited by 110 million people in the last quarter (and an average of one million per day). Visitors compared to 50,000 people on average who attended the Macworld Expo. The activity of Apple, said the CEO, generated in fiscal year 2011 revenues of $ 108 billion, or 43 billion more than fiscal 2010, is also more than the combined turnover of HP, Dell, RIM and Nokia (see Dell and HP are sales of Apple). Apple shareholders, who have received no dividends since 1995, are left dry mouth, because without knowing whether or not things would change. Tim Cook reiterated that the subject was under discussion within the board and the executive branch of Apple: "We will do what we think is in the interest of shareholders." Regarding the possibility that Apple makes a "split" of its shares (1 share being replaced by two divided by a value of as much) as it has already done three times in 1987, 2000 and 2005 Tim Cook has been more circumspect. He explained that in the short term it impulsive a movement of securities that become more affordable (the action hovers around $ 500 / € 375 currently, a fortune ...), but this phenomenon was altogether ephemeral and without real effect the long term. A shareholder, for the coup against the idea of ​​a recurring dividend payout, suggested that Apple draws from his hoard to buy video content. Cook dismissed the idea of ​​owning a label or a studio, explaining that Apple did not need to own a record company to succeed it has done in this area: "We gain money through the sale of devices, the goal is not to make money from content. " Clearly, selling content on iTunes is more than ever a means, not an end. Cook then hinted that it was not envisaged in the short term to provide a service to get video content to the map. Apple's contribution in education - a shareholder proposed to fund scholarships for engineering students - Cook responded that a high percentage of Apple employees made donations in the field of education and that Apple abounded equality (see also Apple: the "Matching Gift" opens more employees). Last summer Apple opened its campus to 600 students, a record it is concerned. She also agreed to 750 million in cuts or equipment donations last year. "The contributions of Apple in education will come primarily from what we do with our products," said Cook, after referring Author iBooks provided free. He also slipped at one point that the MacBook Pro was the best selling model among the PCs in the various distribution channels. A meeting of shareholders that ended without being troubled by questions about recent events around Foxconn and Apple subcontractors.